This very fragile piece of paperwork was issued by the James Cycle Co. in April 1932, for a purchase made by Balgores Motors. The paper is super-thin and its amazing that it has survived at all, complete with a receipt for payment gummed to it. I can't quite make out what was purchased in '32, perhaps a bicycle carrier of some kind - the "Samson" by the looks of it. James went on to be well known manufacturers of motorcycles and pushbikes, from this almost-vintage era, through into the 1950s. 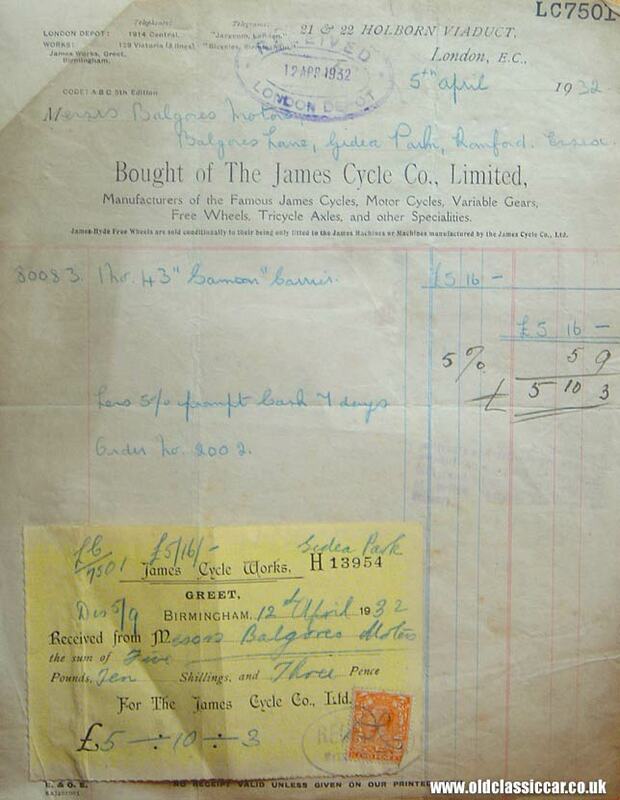 The heading of the invoice reminds us that James not only built cycles, but also motor cycles, variable gears, free wheels, tricycle axles and other specialities. The company had this London depot located at Holborn Viaduct, England, while their engineering base was oooop North at the James Works, Greet, Birmingham. Curiously, there is a small note on the header that says "James-Hyde Free Wheels are sold conditionally to their being only fitted to the James Machines or Machines manufactured by the James Cycle Co. Ltd.
Harry James first made his own cycles in 1880ish from his Birmingham base, with the company officially coming into being in 1897. In 1908 the company re-located to the Greet Works, which is mentioned in the billheading shown above. The company soldiered on til 1966 when it went out of business, having been bought out by AMC some years earlier.